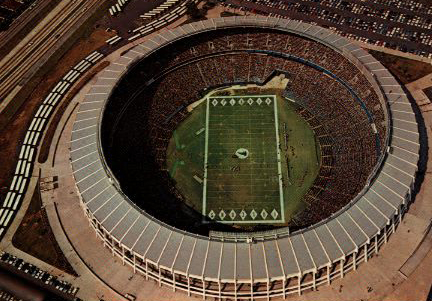 June 30, 1965	National Football League awards a franchise to Atlanta. Owner Rankin Smith, Jr. pays 8.5 million dollars for a team that will eventually be known as the Atlanta Falcons. August 29, 1965	"Falcons" is chosen as the name of the Atlanta team. September 9, 1965	The Atlanta Falcons announce the signing of their first two players, halfback Bob Paremore (St. Louis Cardinals) and Gary Barnes (Chicago Bears), a split end. November 27, 1965	Atlanta Falcons participate in their first NFL draft, selecting University of Texas linebacker Tommy Nobis as the first-round draft choice. He is the first player drafted in franchise history. February 16, 1966	The Atlanta Falcons round out their roster with an additional 42 players via a supplimental league draft. On March 25, 2006 Christopher Kassulke wrote: After Atlanta Stadium was torn down, a brick�outline of the baseball field was created on its former spot. The foul lines are included, a retaining wall surrounds the site, and a 715 marker sits on the spot of Hank Aaron's 715th home run, which he hit at this venue on April 8 in 1974. In other round stadiums designed for two sports, the football field�was laid out from home plate to center field or from the third base dugout to right field/right center. 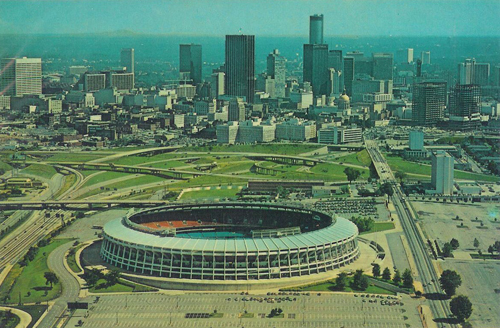 Atlanta Stadium's football field was laid out transversely, from the left field to right field corners. Thus, a seat behind home plate or center field was behind the 50 yard line. The Oakland Coliseum uses this method for its football field as well.